One of the biggest challenges of adapting to Venice is figuring out where to buy every day things. Part of it is cultural: Venetians don't buy their soap or shampoo in drug stores. And, part of it is the result of mass tourism: Ordinary stores have been driven away from the main streets of Venice. But, sooner or later we all need something – a power adapter, access to a clothes dryer, a toothbrush – and though tough to find, all of these things are available in Venice. 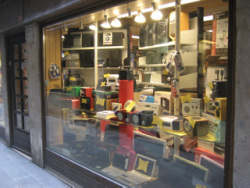 These are some Venetian stores that cater to the everyday needs of people in Venice. 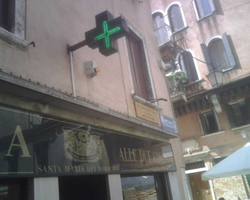 In Venice, a pharmacy is indicated by a green “plus” symbol as shown here. There are pharmacies in every large campo and on most major pubic walkways. You will not find over-the-counter medications sold outside of the pharmacies in Venice. (E.g. You can not buy Aspirin in the grocery store.) So, if you are not feeling well you should go to a pharmacy and talk with the pharmacist. Healthvenice.com provides an interactive map of pharmacies, hospitals, first aid stations and heart health centers in Venice. And, a complete list of pharmacies in Venice, with addresses and telephone numbers is available from Veniceworld.com. View the list HERE. Tip: Just as you are not going to purchase over-the-counter medications in the grocery store, you should not count on purchasing personal hygiene products in the pharmacies in Venice. Though a pharmacy might have a limited supply of toiletries, prices will be extremely high and variety sparse. Plan on buying personal products at large grocery stores, or in the shops mentioned in this section that specialize in personal products. Beautyfull 6374 Castello, On Calle Dell'Ospedatello. Beautyfull is the largest and most reasonably priced shop selling cosmetics and personal hygiene products in Venice. Go there for soaps, hair products, personal products, skin care products as well as some small home goods and house cleaning products. Clinica Della Scarpe 838/A Calle Due Mori, Near Rialto. Serafino 1058/A Rio Tera San Silvestro, Near Campo San Silvestro. Most rental apartments in Venice, even if they provide a washing machine, will not have a dryer. You'll notice that most Venetians hang their clothes out to dry. So, it can be very helpful to know about your options for doing a wash while in Venice. ORANGE operates two laundromats in Venice, in Santa Croce on Chioverete de San Simeon & On La Giudecca near the Zitelle Vaporetto stop. EffeErre operates one self-service laundromat in the Castello district on Ruga Giuffa near Campo Santa Maria Formosa. The washers and dryers at the Venetian laundromats are pay machines operated by a central system. The machines accept cash and can provide change for larger bills. There are also vending machines that sell detergent. If you are sensitive to detergents, you can find other varieties at the BILLA, Il Bottegon and other large convenience stores. Sewing & Knitting Supplies. Roni 5784 Castello on Salizada San Lio. 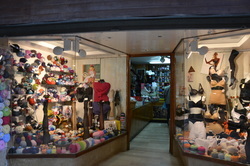 Roni is a lingerie, knitting and sewing supplies store located on the Salizada San Lio. This is a good shop to know about because you will not find sewing kits in the “usual” places like pharmacies and home goods stores in Venice. So, if you find you've got a darning emergency during you stay in Venice this is the only place to go. The needles and thread for everyday use are somewhat concealed behind the jumble of other goods for sale here. Don't be shy about asking.